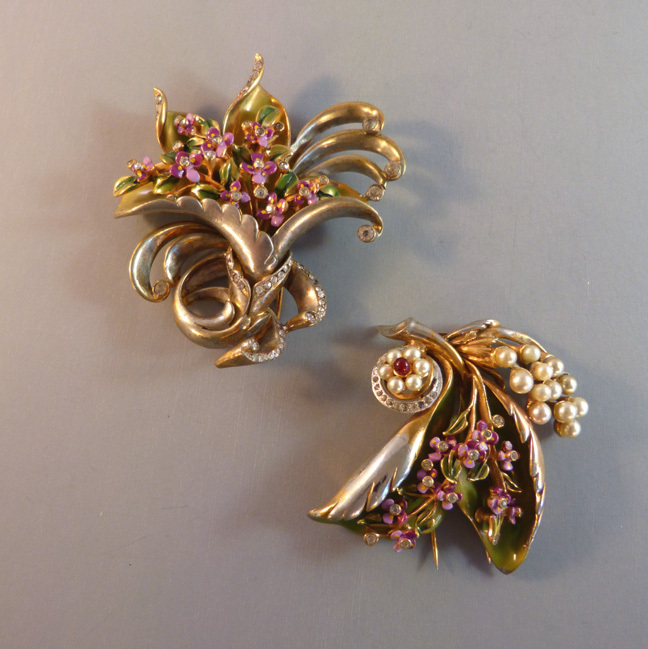 Welcome to the beauty, history and art that is vintage jewelry. 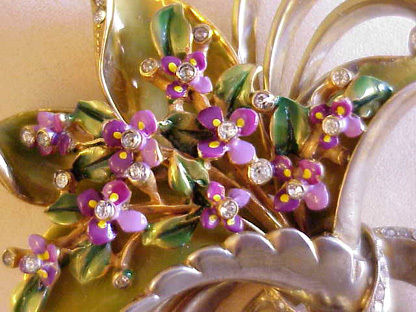 We buy and sell vintage rhinestone, costume, designer, bakelite, and antique Georgian & Victorian jewelry, sterling, and accessories. 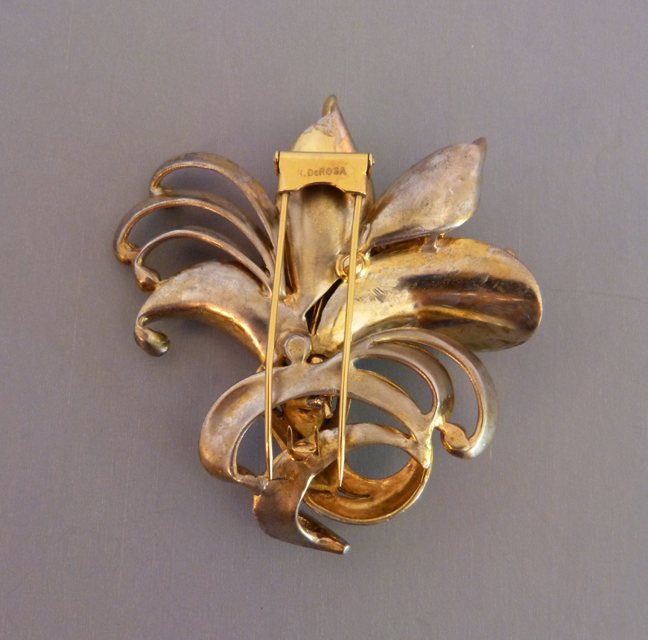 To be alerted when NEW ITEMS are added to the site, please e-mail jane@morninggloryantiques.com and we will be glad to add you to the contact list. 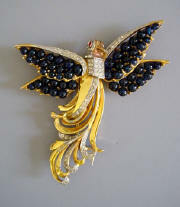 All jewelry is in excellent vintage condition unless specified otherwise. 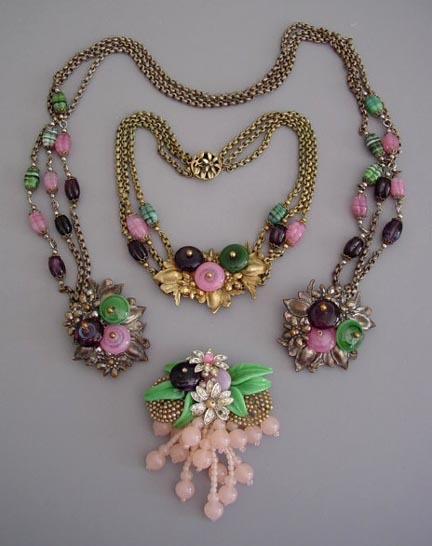 All items are subject to prior sale. 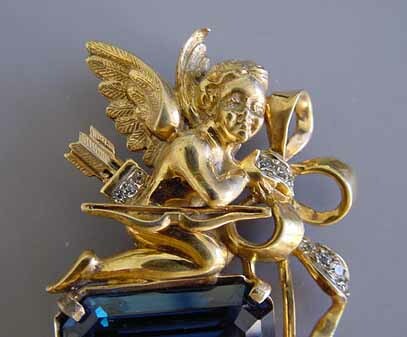 We work constantly to offer extensive jewelry research, pictures and information on our reference site " Jewel Chat " and gallery " Morning Glory Collects ". 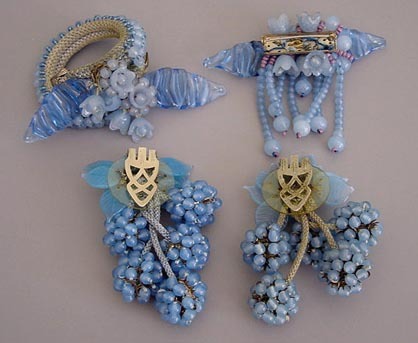 We share our reference material free of charge and work hard to make it accurate, but as with any research, mistakes can be made. 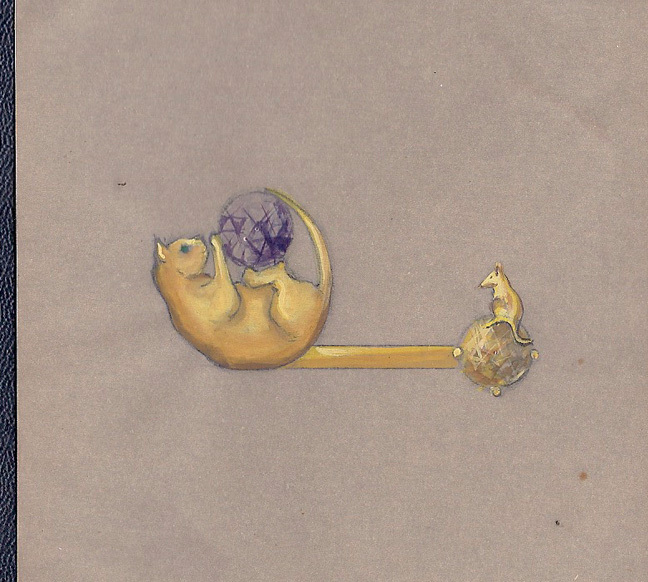 We are not responsible for the use you make of the information here or the honest mistakes that may occur from time to time. 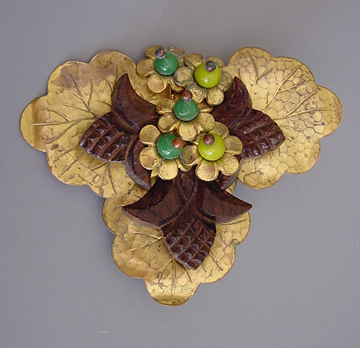 We do not offer identification, valuation or appraisal services. 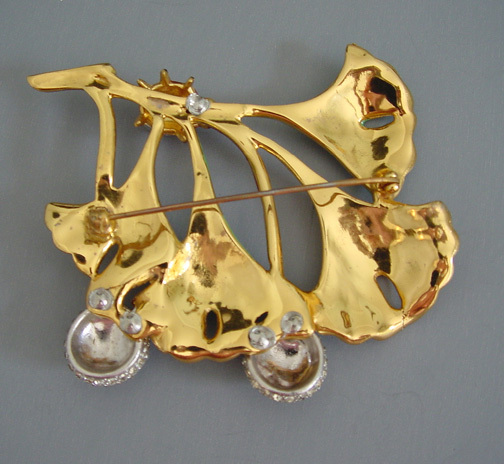 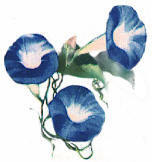 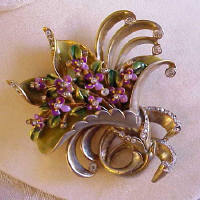 TO PURCHASE: You are on a reference page of Morning Glory Antiques & Jewelry. 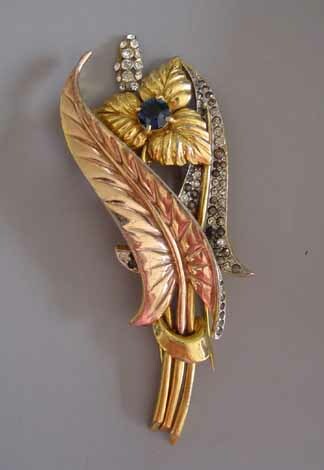 Many of these items were photographed from private collections, and are for reference only, but you are always welcome to ask. Jewelry that is available TO BUY can be accessed by clicking HERE. 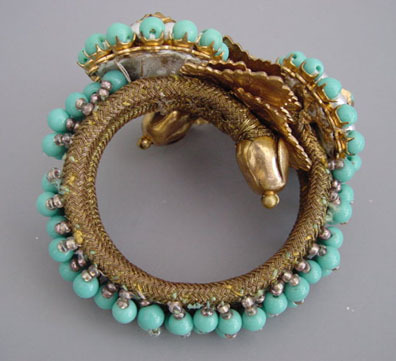 Like any other artist, each jewelry designer is inspired in a different way. 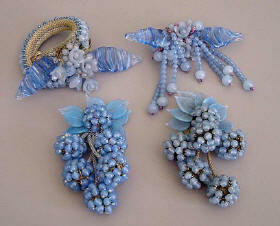 For some it might be a color of Czech beads or a line of rose montees, for others, a flower from nature. 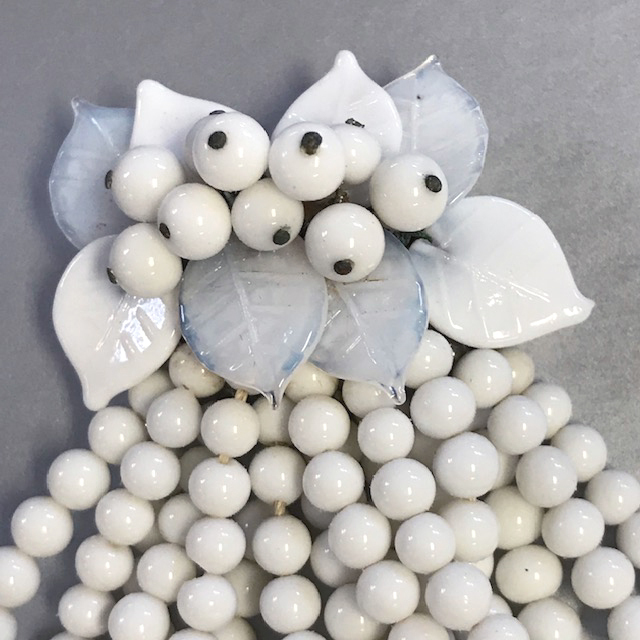 Often a line was requested by the marketing department who took into account the styles and colors of each season, the beads, rhinestones and findings available, and the cost of manipulating these into a 3-4 lines each year. 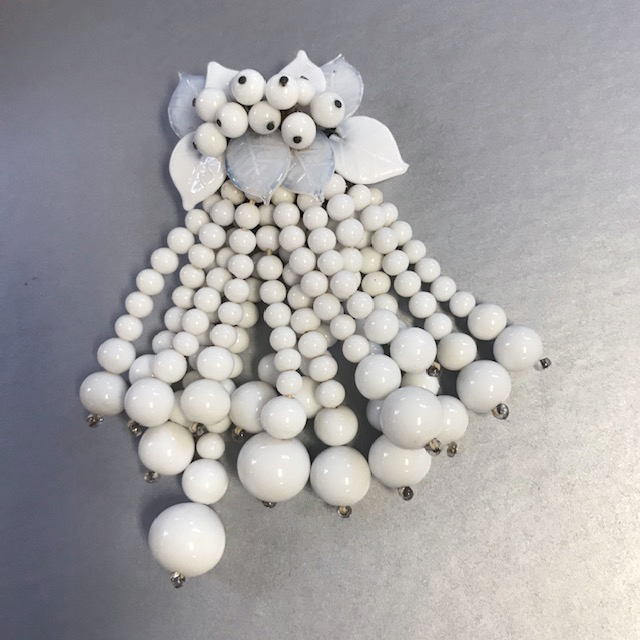 How the designer takes his inspiration from idea to materials to finished product is a journey rarely thought of when we enjoy the jewelry we wear. 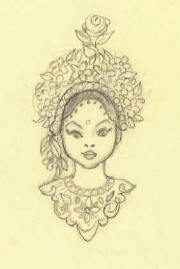 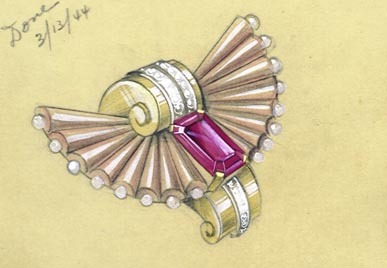 Rosenstein design pencil sketch for the bejeweled headdress brooch shown at right. 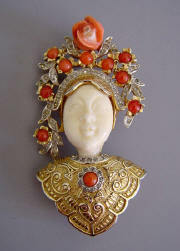 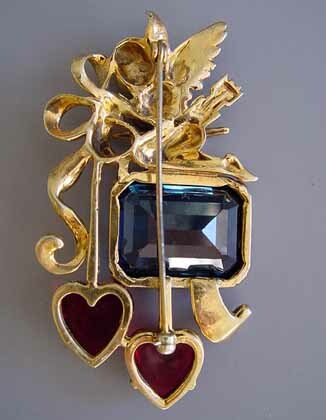 In the small art work of jewelry designers we are lucky to have miniature treasures to reference the history of jewelry. 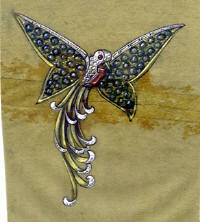 Most of these design paintings are gouache and/or ink on parchment. 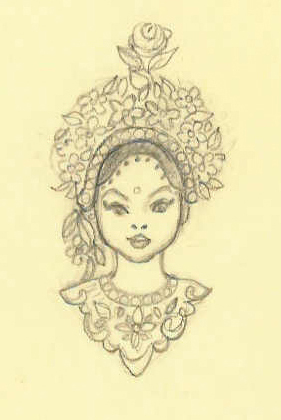 They demonstrate the development from an original idea to the finished product and lend insight into the creative process. Because some jewelry designers manipulate their materials to form an original work from which other pieces could be duplicated, art work for some pieces never existed. But others first develop their ideas on paper, thereby using material that was meant to be temporary. 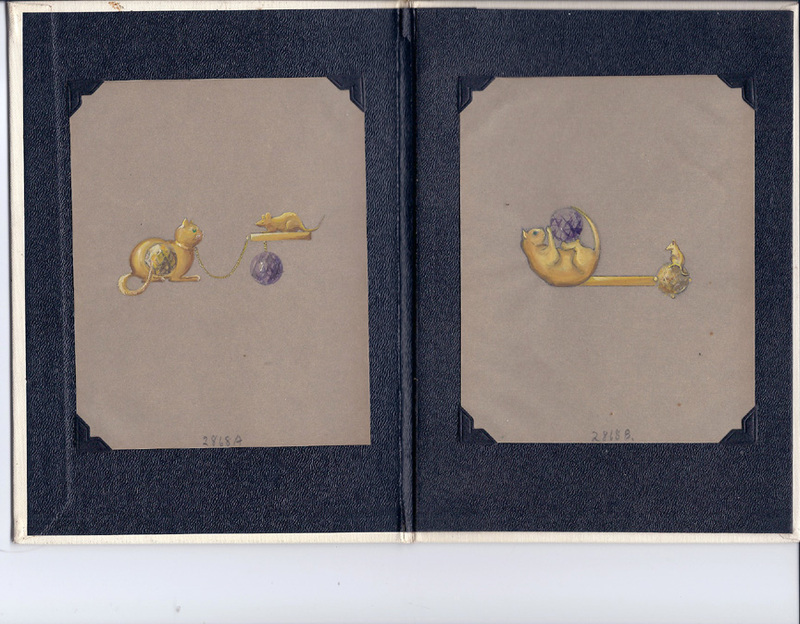 so it is amazing that any of these ephemeral pieces have survived. In many of these illustrations, an under-drawing in graphite can been seen, which was then colored with gouache. 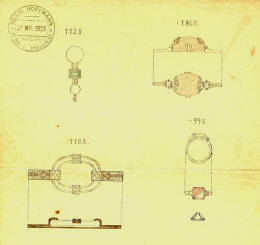 Some illustrations also have notes indicating changes to the designs or dates of manufacture. 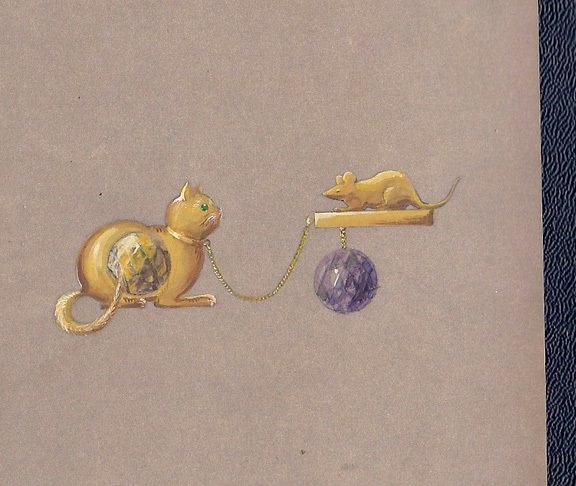 The amazing detail and color belies the short life span these illustrations were meant to have. 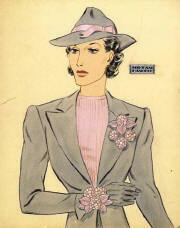 The art work and designs on paper shown here are from the DeRosa, Haskell, Rosenstein and Barclay companies. 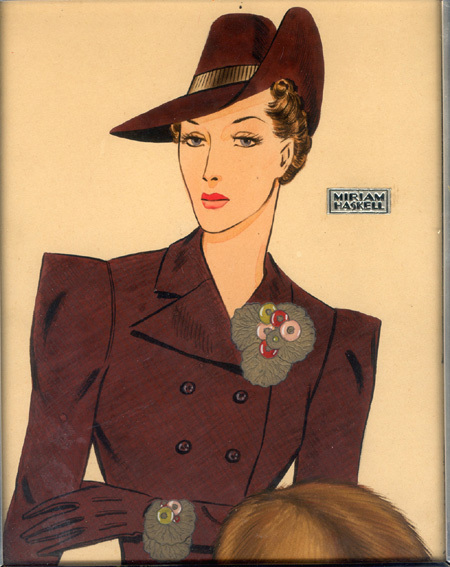 While some of these pieces actually went into production, some did not, and some had changes made to the original design as the marketing departments and sample makers made desired adjustments. 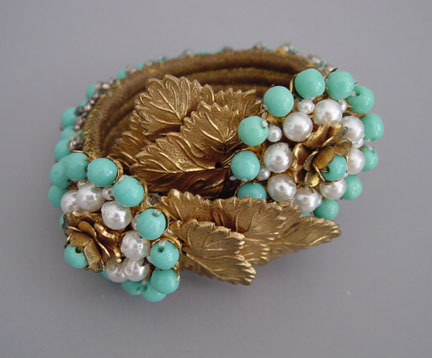 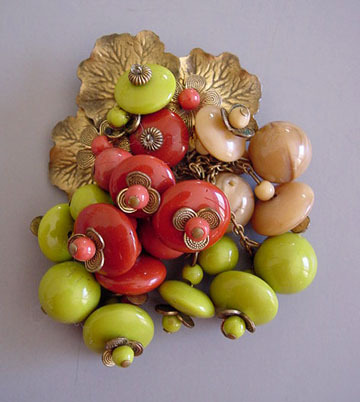 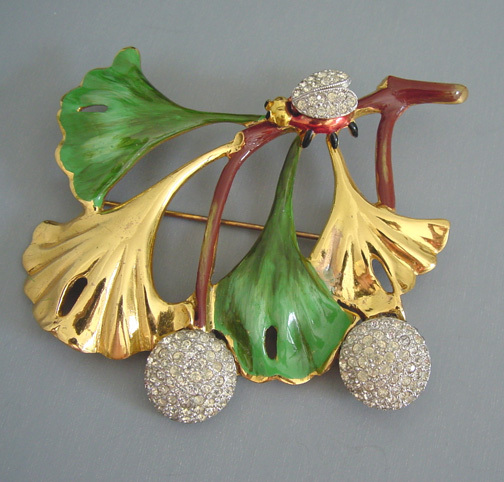 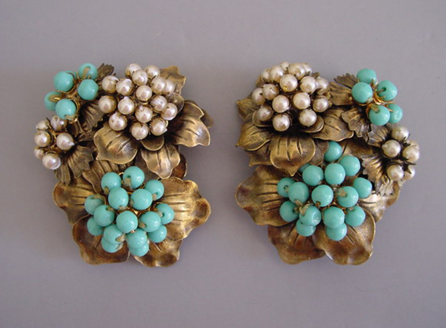 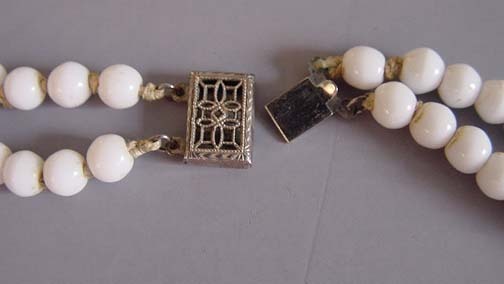 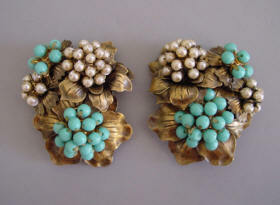 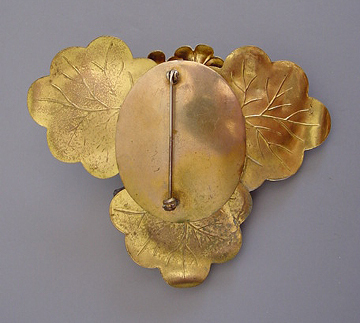 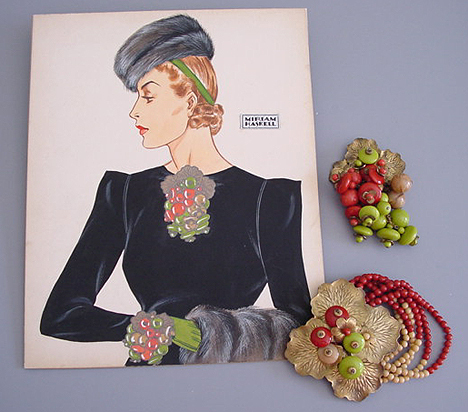 Fine jewelry was another the direct inspiration for vintage costume jewelry. 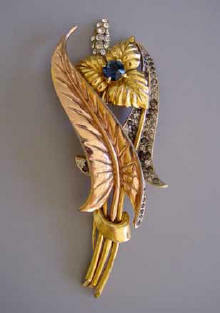 Trifari and Coro are good examples of costume jewelry makers who recreated fine jewelry in less expensive materials. 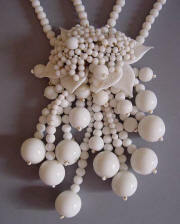 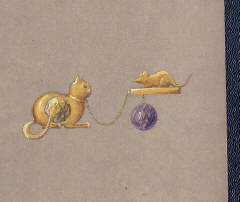 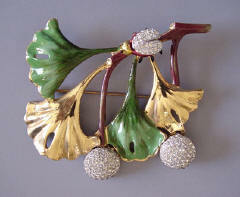 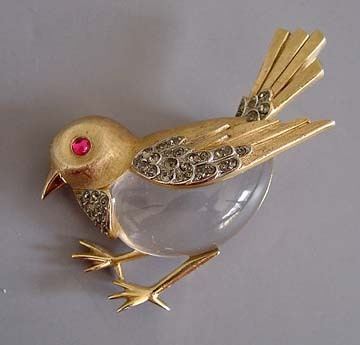 Lucite jelly bellies were copied from brooches that may have been created in originally rock crystal set in karat gold. 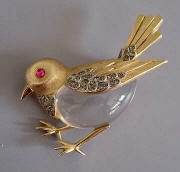 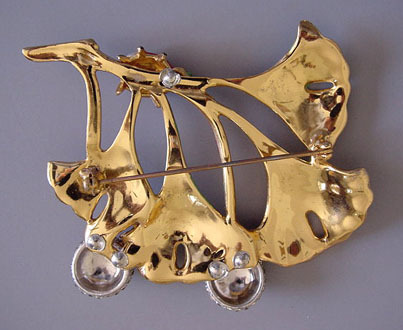 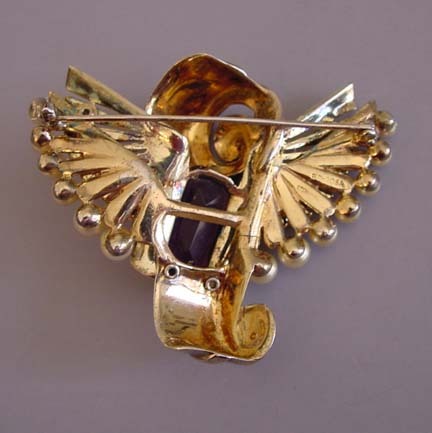 The Trifari jelly belly bird brooch, for example (shown at right below), could be one of these. 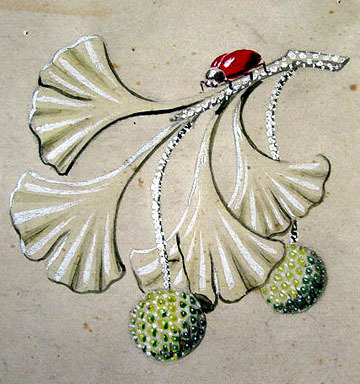 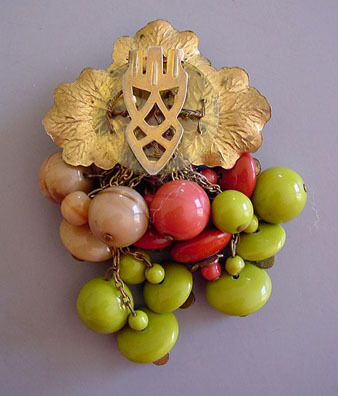 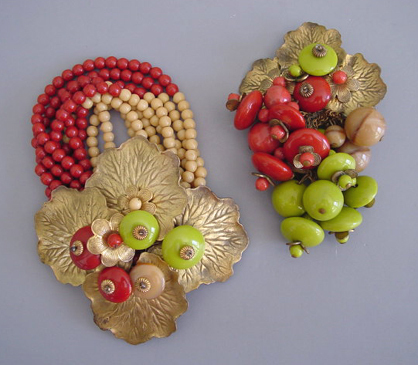 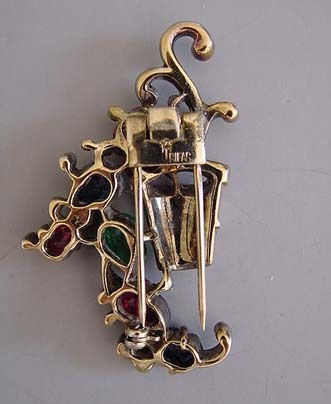 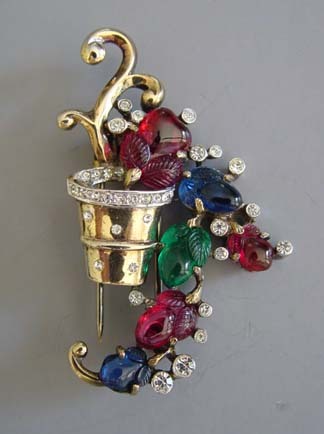 The same is true of Cartier's "tuttie fruity" which, like the Trifari clip shown below, used richly colored and shaped red green and blue fruit-shaped elements as a part of the design. 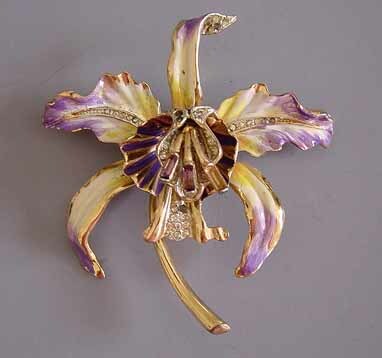 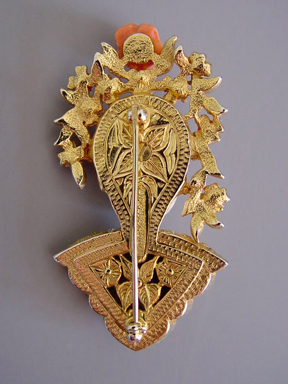 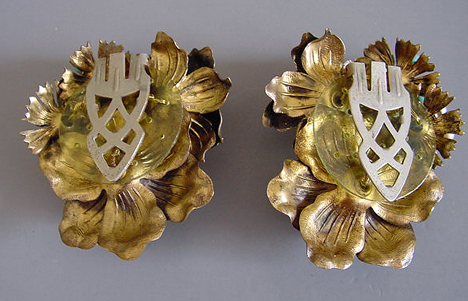 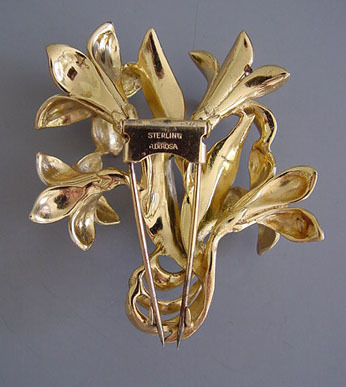 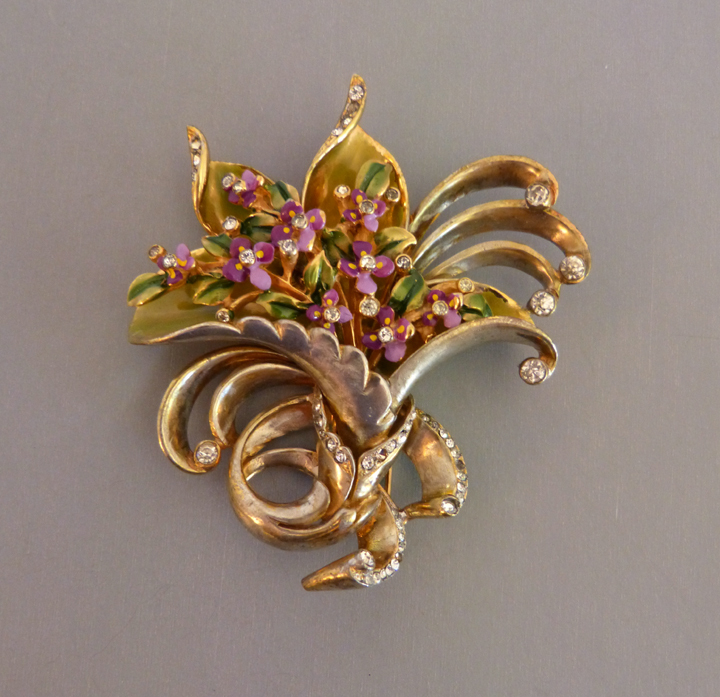 Tiffany did a series of enamel and diamond orchid brooches in the 1890s, and Coro mimicked them in the enamel and rhinestone orchid pins done in the 1940s, like the one shown below left. 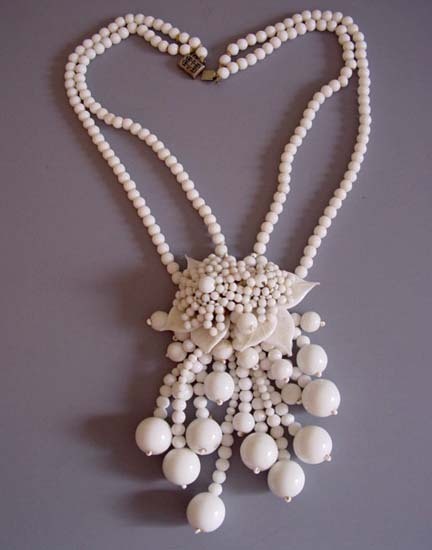 Much of this jewelry was designed from the early 1930s to the late 1950s for a celebrity clientele from Hollywood to royalty. 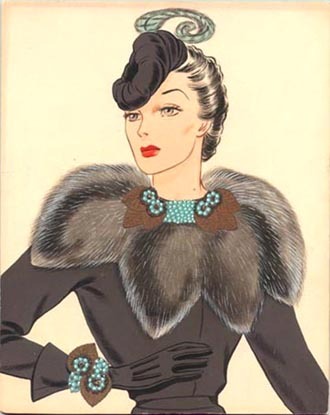 The jewelry was often featured in glamorous photos in Vogue, Harper's Bazaar other magazines of the era. 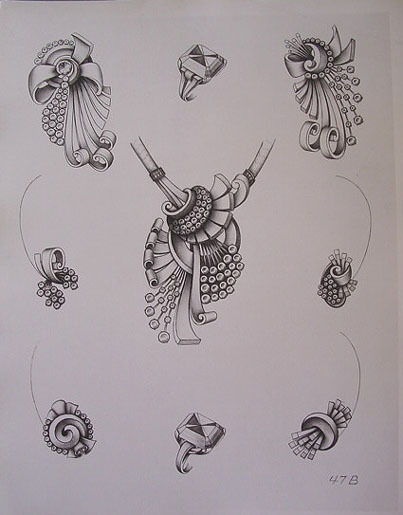 Any research of jewelry will show motifs repeated in both fine and costume jewelry, and many of the motifs go back 200 years or more. Artist's renderings of finished jewelry were used as advertisements in both shops and magazines. 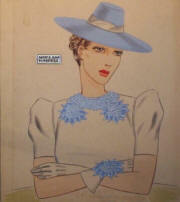 The Miriam Haskell original watercolors shown below were hung in boutiques and distributed to buyers at department stores. 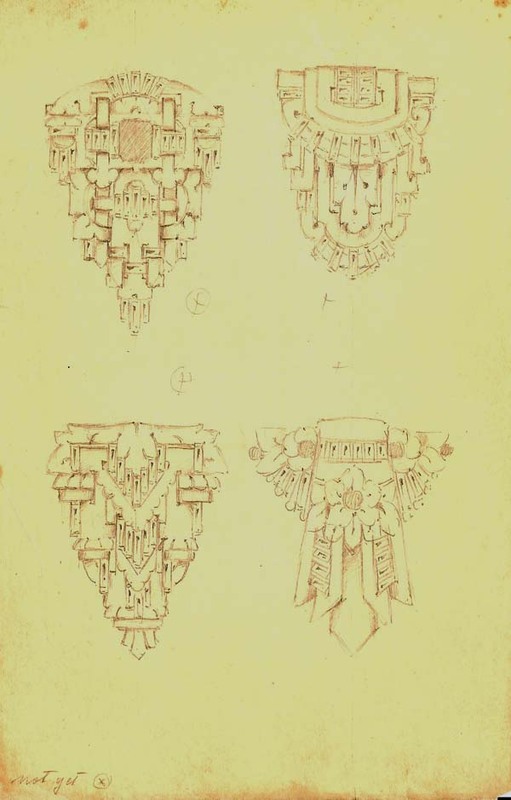 Many of these are thought to have been painted by Larry Austin, an illustrator about whom little is known other than this work. 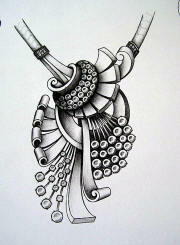 If you were to see the ad and not be familiar with the jewelry itself, you might think he took artistic liberties. 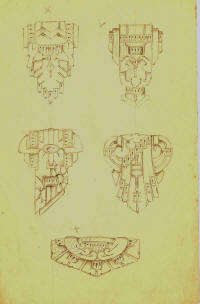 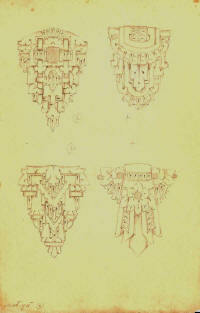 Once you compare them side-by-side, however, you can see how accurately he represented the details of each lovely piece. 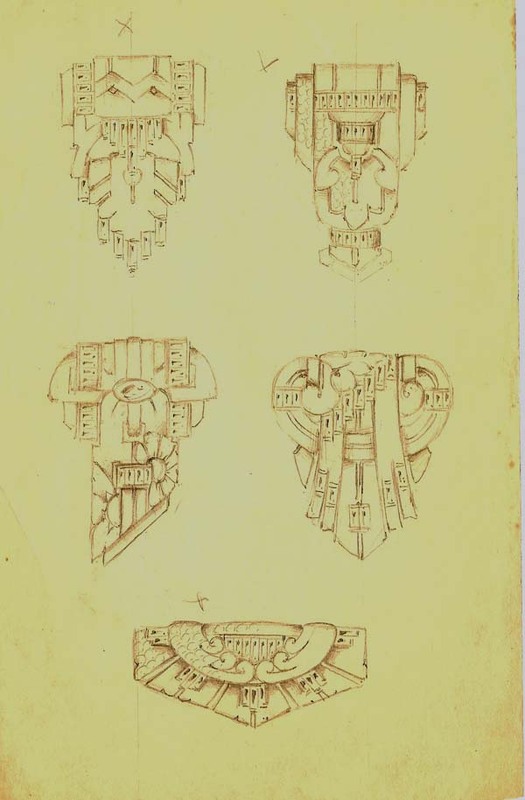 Since these illustrations were done during the period when Frank Hess was the head designer and Haskell did not mark their jewelry, the are invaluable in identifying early Haskell pieces. 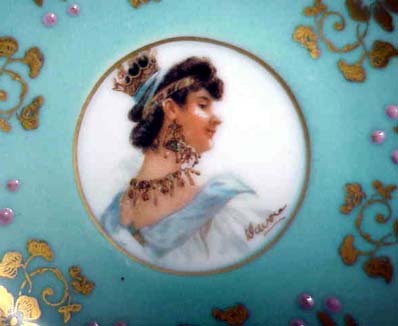 It is common for dealers and collectors try to attribute unmarked jewelry for both historical interest and perceived increase in value. 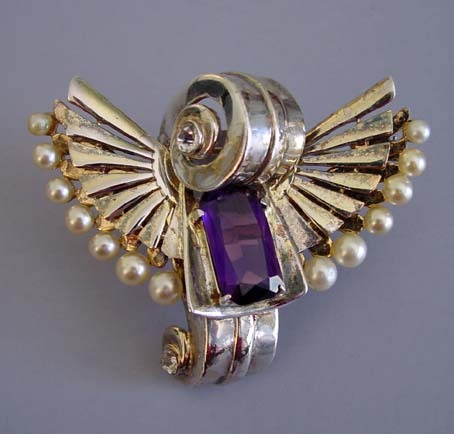 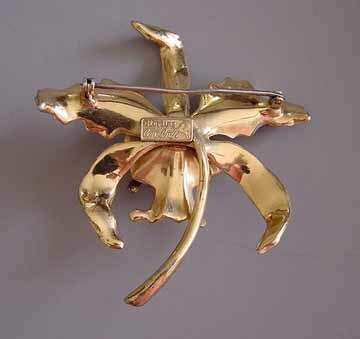 In the early days of Miriam Haskell jewelry, for instance, when Frank Hess was the head designer, Haskell put no identifying marks on their jewelry. 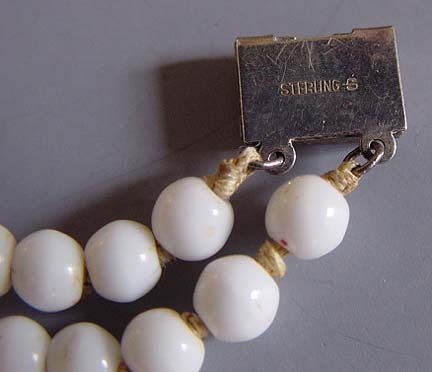 It was not marked at all until about 1947. 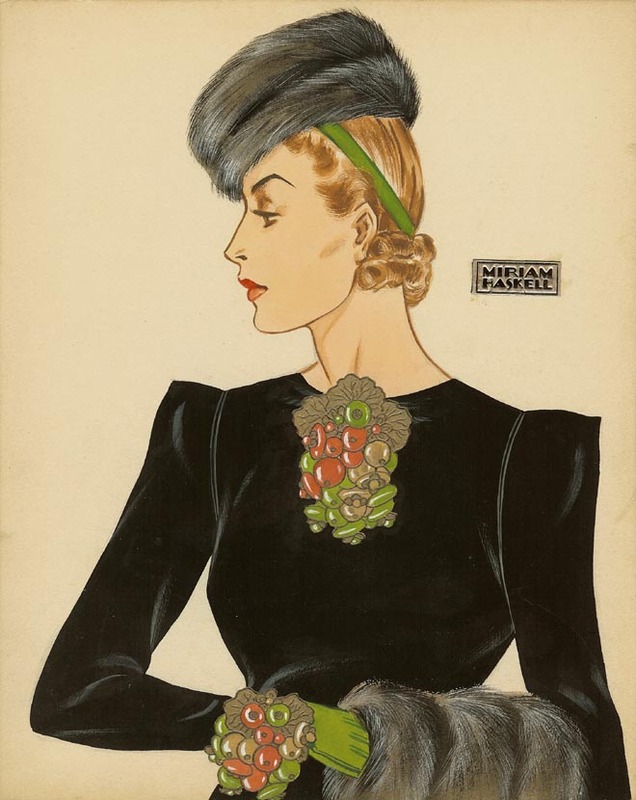 Today, the early unsigned pieces are recognized by their wonderful detailing, hand work and design, and by comparison to these early advertisements. Original art work and vintage advertisements often offer a more reliable method to confirm these attributions than do findings or general style. 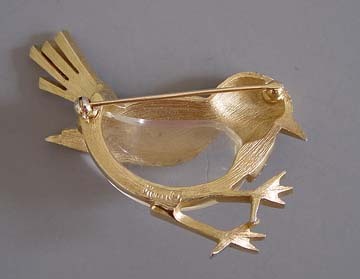 The bird brooch on the left below, for instance, had all the attributes of a DeRosa piece, but it was not until I found the original art work that I could definitely confirm it. 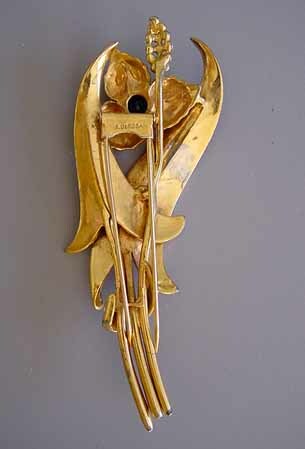 Conversely, I own the cupid and hearts clip (below right) that I attributed to DeRosa for years, only to discover my mistake when the original magazine advertisement came my way, identifying it as a Kreisler piece. 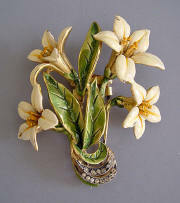 When art work is dated it is another affirmation of the styles that were popular during a particular period. 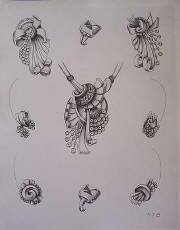 BARCLAY art work for a brooch, earrings and rings designs. BARCLAY art work for a necklace design. 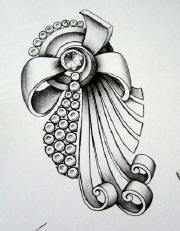 BARCLAY art work for a brooch, earrings and rings designs. 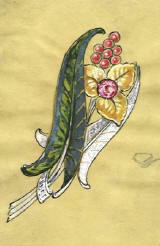 BARCLAY art work for a brooch design. 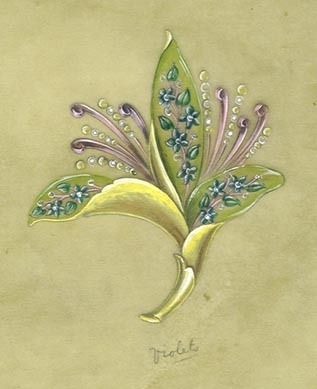 DRAWING probably for dress clips or brooches circa 1930. 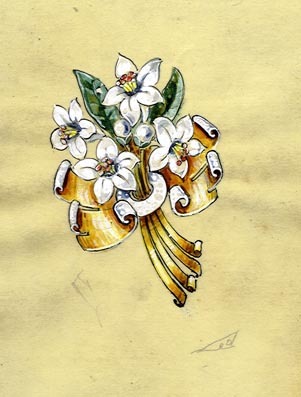 DRAWING probably for dress clips or brooches circa 1930. 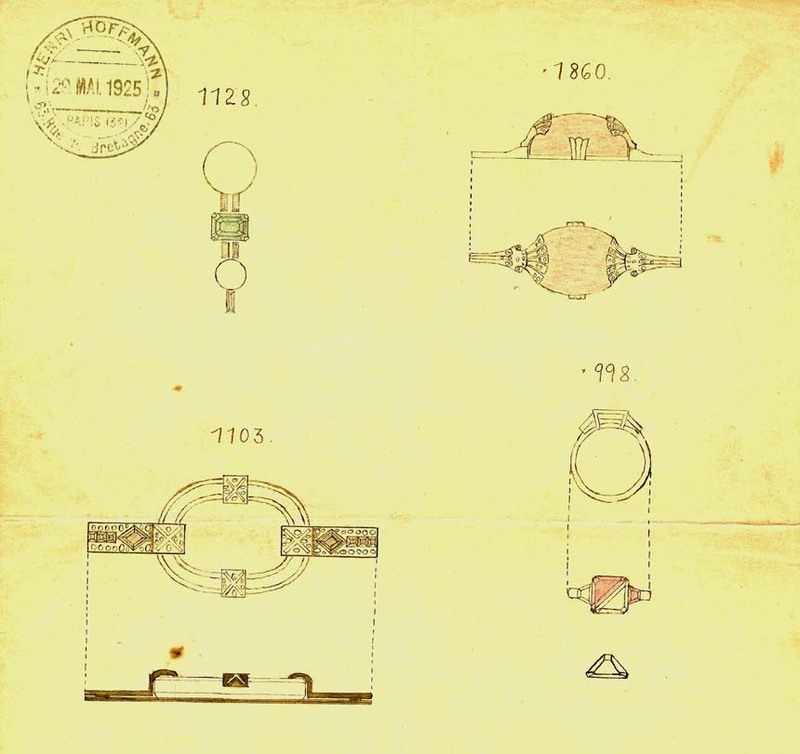 DRAWING stamped in French "Henri Hoffmann, 29 Mai, 1925, 63 Rue de Bretange, Paris. 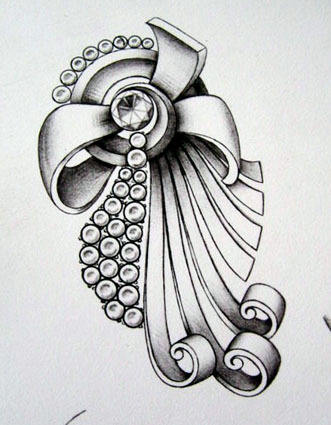 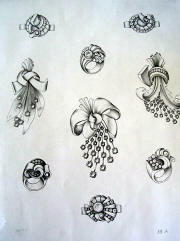 These drawings are of rings and brooches. 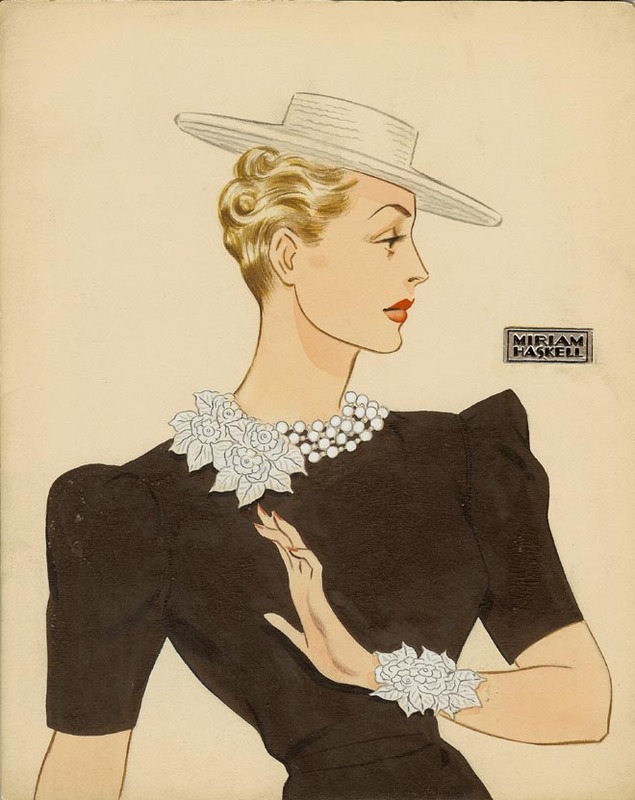 Jewelry can certainly be enjoyed for it's beauty and whimsy alone, but if you are at all interested in it's history the hints given by the design art, advertising and illustrations are an excellent reference and research tool. TO PURCHASE: You are on a reference page of Morning Glory Antiques & Jewelry. These items were photographed from private collections, and are for reference only. PLEASE NOTE: Regretfully, it is no longer possible to respond to individual questions regarding jewelry history, identification or value, or to offer written or verbal appraisals or opinions. 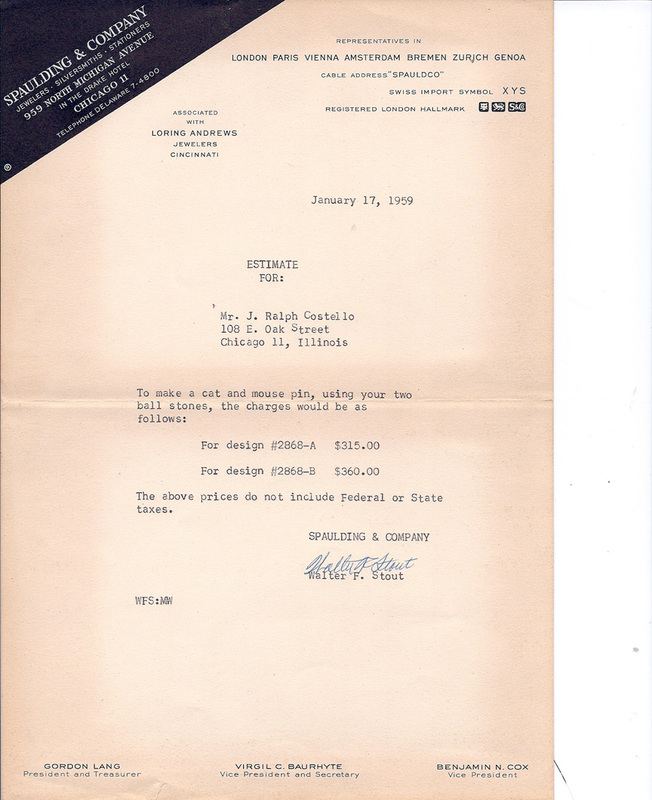 The demand for this kind of information is absolutely too overwhelming for one dealer to fill. 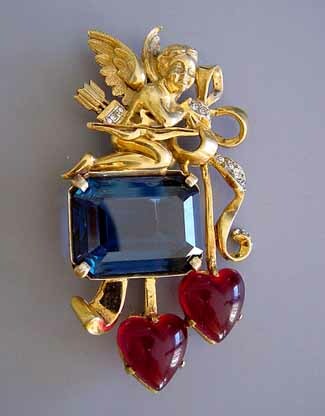 I love jewelry, but appraising and selling are two entirely different businesses, and I choose selling and research as my business. Instead, articles are added on a regular basis to JEWEL CHAT on line Magazine, a wonderful reference for information on many makers and styles of vintage jewelry. 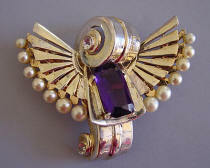 For information on valuing your jewelry, click HERE.